Over the past sixty five years, Israel has faced and continues to face momentous challenges including wars, skirmishes, rocket attacks, terrorist murderous suicide bombings and assaults on her citizens, challenges to her legal status, boycotts, threats, accusations and demonization. In the summer of 2000, Chairman Yasser Arafat of the Palestine Liberation Organization met at Camp David with President Clinton and Prime Minister Ehud Barak. The Prime Minister offered to the Palestinians an agreement that included the establishment of the Palestinian state based on territorial borders that essentially constituted approximately 96% of the land located west of the Jordan River, known as the West Bank and included the Gaza strip on the Mediterranean. Much to the chagrin of President Clinton and disappointment of PM Barak, Chairman Arafat did not accept the proposal and left the President and the Prime Minister essentially standing alone at Camp David. Shortly thereafter, in late September 2000, the Palestinian uprising known as the Second Intifada commenced, bringing with it murderous suicide bombings and other attacks inside Israel, targeting busses, shopping centers, hotels, restaurants, University cafeterias and attacking people in their homes and in the streets. In response, in order to protect her people, the Israeli government commenced construction of a terrorism prevention security fence, parts of which include concrete barriers akin to what we know as Jersey walls on our expressways, although portions are quite high and obtrusive in order to provide safety to vehicles and persons below. The action of the UN General Assembly, bypassing the UN Security Council in spite of the Security Counsel’s primary role in addressing matters of peace and security, sought an advisory opinion of the International Court of Justice as to the legal issues surrounding the construction of the terrorism prevention security fence, which some prefer to call a separation barrier. Admittedly, the fence/barrier snakes through lands that include olive groves, farming fields and runs adjacent to villages, towns and even cities on both sides of the barrier – the Israeli side and the Palestinian side. Some have accused Israel of establishing a de facto border between the Israelis and the Palestinians. Others have accused Israel of establishing an apartheid wall, segregating and dividing Israel and the Palestinian territories, accusing Israel of doing so on some racial basis akin to racial segregation in South Africa. For many decades, the United Nations has been used as a bully pulpit to accuse, attack, malign and demonize Israel in the court of public opinion. Each year, resolutions are adopted which focus more on Israel than any other nation-state member-state of the UN than all other members/states combined. The question referred by the UN General Assembly to the International Court Justice itself evidences the bias of the United Nations against Israel as you can see from the use of such words as “wall”, Occupying Power, Occupied Palestinian Territory and references to principles of international law including the Fourth Geneva Convention of 1949, invoking human rights standards. At the United Nations, every country in the world has one vote. We all believe in the concept of one person one vote in America; but at the United Nations, the rule of one country one vote means that in almost every instance Israel loses due to the voting bloc that exists between the Arab countries and others who have no diplomatic relations with Israel, thereby assuring that Israel has no fair standing at the UN. In fact, at the UN, only Israel cannot sit on the Security Council. One country; but no vote for Israel. In 2004, when the International Court of Justice, sitting in the Hague, in the Netherlands, convened at the Peace Palace for deliberations on the issue of the requested advisory opinion, Israel, the United States, Canada and other countries strongly challenged the jurisdiction of the Court to accept review of the issues and issuance of the Advisory Opinion. However, the judges of the International Court, each from a different country, overruling the objections as to jurisdiction, determined that it would review the legal issues involved in Israel’s building of the wall. As counsel for the Washington, DC based non-profit organization, the Foundation for Defense of Democracies, our law firm submitted to the Clerk of the International Court of Justice on the issues being presented to the ICJ. Our firm’s argument was precise: Israel, like every nation-state in the world, has the right and obligation to defend her people. Our focus was on the barrier being not a border but an attempt to protect the civilian population of Israel by fencing out the terrorists, particularly in the context of the raging Second Intifada. On the days when the ICJ convened, we went to the Hague. It was indeed an odyssey. Organizations brought a burned out bus from Israel to the Hague and parked it outside the Peace Palace. We participated in a rally for human rights and on behalf of the victims of terrorism and marched to the Old City Hall in the Hague where in the presence of Members of the European Parliament, victims of terrorism testified, clearly enunciating their pain over the loss of loved ones. I remember like yesterday one father holding up the bullet that entered his child’s eye. He cried. We cried. The Members of Parliament cried. Maybe for the first time, they got it. The barrier was not a border, but a protection effort to save lives. Every nation state in the world is entitled to build a fence on its borders … and many have done so. The Great Wall of China was built not for decoration or to be seen forever as a great wonder of the world, but was built for defensive purposes. The United States has border fences with Mexico. Many countries have built such barriers. But only Israel, which is regularly castigated at the United Nations, is held to double standard scrutiny and presently accused of being an apartheid racist criminal state. The issue of accusations of racism against Israel is not new. The infamous Zionism = Racism resolution passed by the United Nations in the 1970s is not just bland history. Efforts to brand Israel as unworthy of nationhood, accusations of her committing violations against human rights are legendary. So it was no surprise when the ICJ agreed to review the matter of legal issues involving the barrier between Israel and the Palestinians. And it was predictable that the ICJ would issue an advisory opinion that expressed its view that Israel was in violation of international law for doing what we believe every nation is entitled, and obligated, to do: protect and defend her citizens. And, how sad and in many respects shocking that the ICJ gave no credence to the issue of the reason – the need – for Israel’s construction of the fence, nor the plight of the victims of the unbearable unimaginable heinous murderous attacks and suicide bombings committed within Israel proper nor did it give any deference to Israel’s High Court of Justice which was itself seized of the matter, had issued a recent thorough opinion mandating relocation of certain parts of the fence (and which has subsequently issued additional opinions ordering compliance by the Israeli government with changes in the fenceline in order to accommodate various considerations and needs of the residents in the area, both Israelis and Palestinians). The ink on the advisory opinion was barely dry before the Palestinian Liberation Organization, as the recognized sole representative of the Palestinian people, was calling for war crimes accusations to be leveled against Israel, relating to the fence. Those accusations continue to this day. They are embodied in threats by the PLO and its PA to bring Israel and her leaders before the International Criminal Court, another court based in the Hague. Just recently, the news of the commencement of negotiations between the Israelis and the Palestinians was accompanied by the reference to the Palestinians holding off taking Israel and her leaders to the International Criminal Court at the Hague…but threatening to seek action of the ICC if the Israeli-Palestinian negotiations did not proceed to the liking of the Palestinians. Israel’s battle for justice at the United Nations continues to this very day. They are also embodied in efforts organized by the PLO to urge governments of the European Union and others to boycott Israel’s products if the products are produced in the towns, villages, cities and communities known as settlements. The politics of fear also continues, as the threat of a Third Intifada looms. Israel indeed lives, as Prime Minister Netanyahu has so often said, in a dangerous neighborhood. Lebanon on her north is under the control of Hezbollah, the terrorist organization that bombed the Israeli Embassy in Argentina in 1992 and the AMIA Jewish Center in Buenos Aires in 1994. For those acts, sponsored by the Islamic Republic of Iran, there has been no justice. Syria on Israel’s northern border remains in a constant state of war with Israel, which was recently attacked by Assad’s armies launching rockets into Israel and attempting to move chemical and other major weapons to Hezbollah which has tens of thousands of rockets pointed at Israel, provided by the Islamic Republic of Iran, which has threatened to annihilate Israel. While Israel has entered into peace agreements with the Hashemite Kingdom of Jordan and Israel’s east, and with Egypt on Israel’s south, each peace has been cold although relatively stable until the recent turmoil has wreaked havoc throughout the Middle East. The Arab Spring has brought more threats and instability than flowering trees. Attacks from Gaza upon Israel have continued full throttle since the commencement of the Second Intifada in 2000 even up until recent days. Only since Operation of Pillar of Defense, when Israel mounted a massive response to the thousands of rockets launched from Gaza, landing in various Israeli cities and areas has there been relative quiet on the Israeli-Gaza front. Terrorist infiltrators regularly attempt get into Israel by getting around the terrorism prevention security fence. And, yet, in the face of constant threat to not just Israel’s security, but to the lives and limbs of her people, of visitors and even of embassy personnel, the Palestinians and the United Nations continue their calls for Israel to “tear down that wall”. The security barrier has saved lives. The security barrier has kept terrorist infiltrators from entering Israel. The security barrier is not a border but a barrier designed to protect Israel’s citizens. 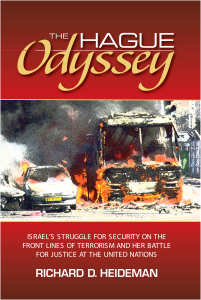 In my recently published book, The Hague Odyssey: Israel’s Struggle For Security On the Front Lines of Terrorism and Her Battle For Justice At the United Nations (Bartleby Press, 2013) I examine issues and controversies that surround Israel’s construction of the terrorism prevention security fence and Israel’s rights and obligations as a responsible government that acts with respect for human rights and the dignity of humankind, contrary to those who choose to malign Israel. The legal and factual analysis is comprehensive with a goal of walking the reader through the court’s advisory opinion and its implications, both from a public policy perspective and in international law. It is essential, in my view, for people to acquire a meaningful understanding of the threats faced daily by Israel; the physical assaults; the insults; the attacks on her sovereignty and upon her good name. Moreover, it is essential to acquire insight into the challenges not only faced by Israel but by every nation which takes seriously its obligations to provide protection for her people.